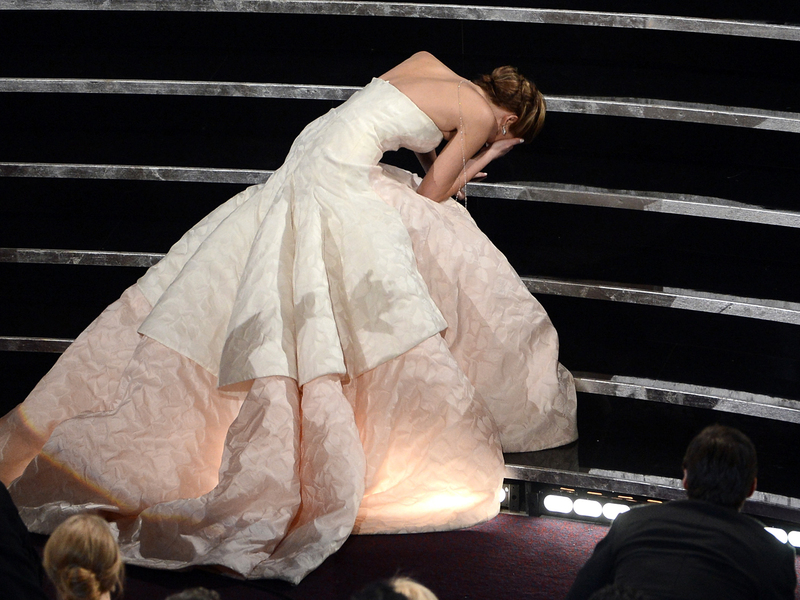 Jennifer Lawrence will not only be remembered for winning the Academy Award for best actress in 2013, but also for the unfortunate tumble she took walking to the stage. The "Silver Linings Playbook" star fell as she walked up to receive the honor on Sunday night. But she bounced back quickly, receiving a standing ovation by the time she made it to the microphone. "You guys are just standing up because you feel bad that I fell," said Lawrence, wearing a strapless Dior Haute Couture gown. When asked backstage what went through her head when she fell, Lawrence told reporters, "A bad word that I can't say that starts with 'F.'" Lawrence, who played a young widow in the romantic film, beat Jessica Chastain ("Zero Dark Thirty") Emmanuelle Riva ("Amour"), Quvenzhane Wallis ("Beasts of the Southern Wild"), and Naomi Watts ("The Impossible") for the best-actress honor. In January, Lawrence won the Golden Globe for best actress in motion picture, musical or comedy. The 22-year-old Kentucky native's performance in 2010's "Winter's Bone" earned her a best-actress Oscar nomination.